Beams+ Fall 2008 Catalog | A Continuous Lean. As mentioned earlier, Beams+ (American Life Shop) was one of my favorite stores in Tokyo. Walking into the shop felt like stepping into a fishing lodge in Wisconsin. Good stuff. The offerings on the Beams+ website are limited, so I thought it would be nice to scan some of the catalog pages for you. So any way/source to get the Weinbrenner X Beams Oxford Work Shoes here in the states? The Beams website wasn’t an-online shop it didn’t seem – right? Some of this only-in-Japan stuff just gets too tempting, teasing, saddening. How do the Japenese do it? Is there anyway we can get items like this in the US? I really liked some of the Champion products that were shown. All over Manhattan I see the same boring black fleece North Face Jacket. I must of counted 20 of them on my way to the office. How can we get the beautiful Purple Label Trench Coat? I know one really good website that will help you get all of this Japanese product. It is frustrating I know, but that is what makes going there so good. Does anyone know whether Alden will custom combine leather and sole options–ala Russell Moccasins? 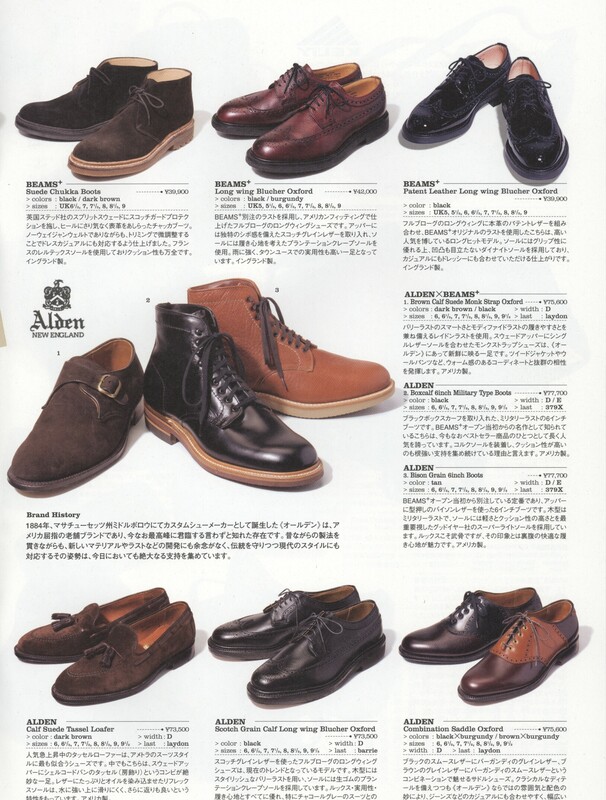 I love the look of some of those shoes and boots pictured in the Beams catalog. pair in Cognac with the crepe sole so I called them up, gave them the style number and they said no problem. You have to custom order through an Alden Shop. Live in NYC? Call the store on Madison. I didn’t have much luck but if you know someone who can read Japanese and you don’t mind paying the shipping this might work. two years ago. (scroll down til you see the navy duffle with rope and wood) I called Gloverall and they told me only Japan received the their duffle with rope and wood closures. I tried like a mother to buy it from Trad House. Emails, phone calls, etc. Nothing worked. Very frustrating. At 65,000 yen this works out to apx$650. Not including the shipping. At least you have free health care! I’ve been inspired by all the recent workwear and rugged gear posts. I went to the Rose Bowl Flea Market this morning. As I pulled into my parking space I noticed alot of the Japanese buyers already done. I spied a pair filling a mini van with at least 5 Redwing Boxes, a couple bags of unboxed boots, along with a stack of Pendletons. There were close to 15 pairs of cool old Nikes all laid out on the asphalt being inventoried. It might be time for me to go behind enemy lines for a rescue mission.